The drugstore has been releasing a lot of rave-worthy products since December of 2011. After quite awhile of lusting over these L'oreal Infallible Eyeshadows and hunting for them in every drugstore I go into, I finally got my hands on three of them. The first one I have is the shade Eternal sunshine, a pale yellow gold. The next is Amber Rush, a coppery brown shade and the last is Bronzed Taupe, a beautiful metallic taupe color. For my first buy I have chosen shades that are neutral and that I most likely will wear often. These shadows are amazing. They are downright a 5/5. 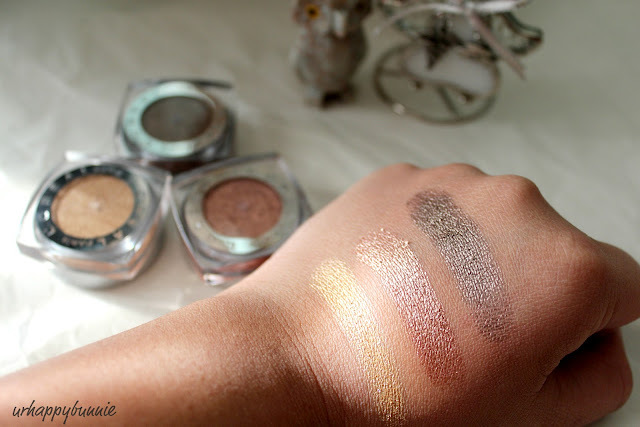 The L'oreal Infallible Eyeshadows are actually loose shadow pigments that are pressed down. They are not cream shadows like most assumed. The shadows are very pigmented and long-wearing too! Even without a primer these shadows last for a really long time and they don't budge. Some say these are very comparable to Armani Eyes To Kill shadows but I can't say that for sure since I don't own any of those to compare. 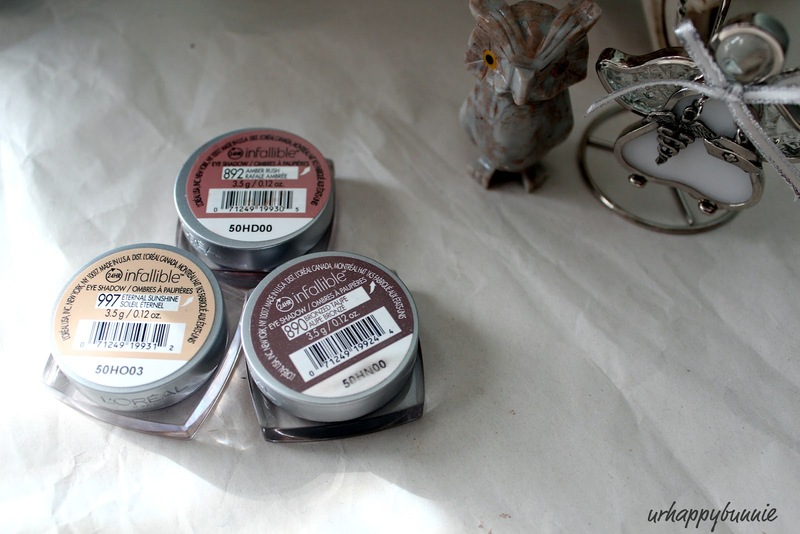 I really love these three shadows I picked up since they are metallic finishes and I love metallic eyes. The packaging for this product is also pretty nice since you can display or store it with the bottom up and you can clearly see the shades. I find however that the Infallible lid is something that they could improve on. The lid is plastic and nice but I would very much prefer it if they have sturdier lids like the lids of Maybelline Color Tattoos or MAC Paint Pots. This is a very insignificant complain but it is something that I just have to mention. For the price of $7.99, it is really worth it and it is a shadow that you cannot go wrong with. 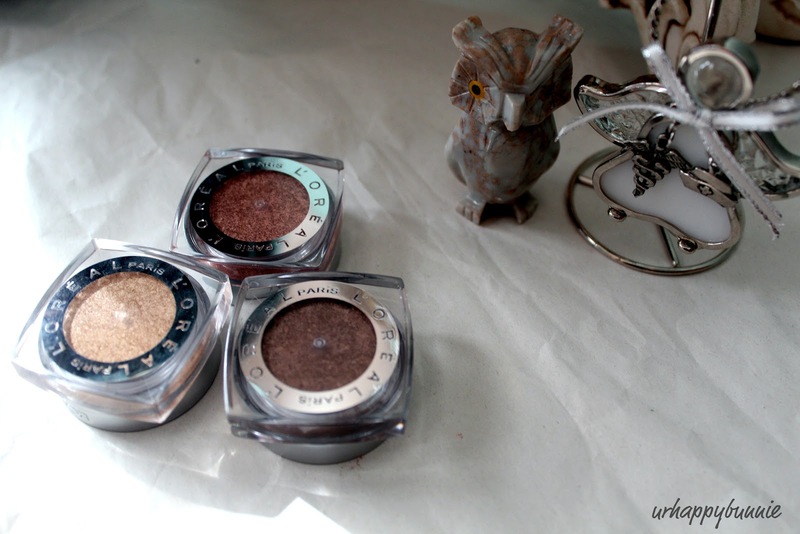 Have you tried the L'oreal Infallible Eyeshadows? i like these better than revlon lip butters if i have to compare them. i have bronzed taupe as well and i really heart it! i havent tried it but have been hearing about it everywhere! clearly you convinced me to give it a shot! I want some metallics and I think you're right that these might be the best bet particularly for $7.99! :) Thanks for showing the swabs! wow all three are beautiful totally pigmented..so pretty shades. Those colors look stunning! Very pigmented! I also think that this eyeshadow is AMAZING! I honestly think L'oreal Infaillible is slightly better than Maybelline Tattoo,evethough I love the Maybelline Tattoo as well. I can't really compare them since they are two different things. One is a loose pressed shadow and the other is a cream shadow. Joanne I'm a fellow pilipino.Do you speak tagalog or straight english? Bit of a random question. haha Just found your blog today and let me just say how happy I am that I found it.I love finding fellow pinay beauty bloggers.Afterall we all should support each other right? These shadows are GORGEOUS. I keep reading all these amazing reviews about them and everytime single time I'm SO tempted to run over to the latest drugstore and pick some up.Love all the shades you picked up. I'm a neutral girl through and through. :) Unforunately I'm saving my money for the vacation in the Philippines. :( So no new eyeshadow purchase for me. Glad you liked them though. These are not out in Asia yet >___< I can't wait to try them out.